The reliability of portable equipment relies almost entirely on the performance of the battery. A dependable battery fleet can only be assured if batteries are maintained on a periodic basis. Battery maintenance also needs proper documentation. One simple method is attaching a color dot, each color indicating the month of service. A different color dot is applied when the battery is re-serviced the following month. A numbering system indicating the month of service also works well. 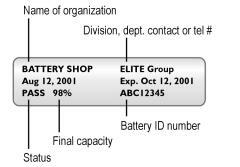 A better system is attaching a full battery label containing service date and capacity. Like the pending service on a car, the label shows the user when maintenance is due. For critical missions, the user will pick a battery with the highest capacity and the most recent service date. The label ensures a properly serviced replacement pack. 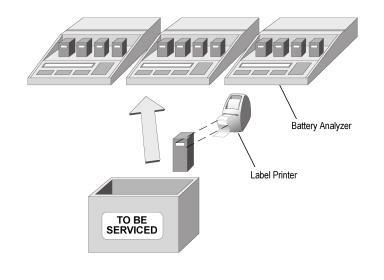 Battery analyzers are available that print a label revealing the organization, group, service date, expiry date (time to service the battery), battery capacity and ID number. The label is generated automatically when the battery is removed from the analyzer. Figure 11-3 illustrates such a label. The battery label keeps track of the battery in the same way a service sticker on a car reminds the owner of pending service. The battery labeling system is simple to manage. It is self-governing in the sense that the users would only pick a battery that is properly labeled and has recently been serviced. The system does not permit batteries to fall though the cracks and be forgotten. It is in the interest of the user to ensure continued reliability by bringing in batteries with dated labels for service. Several methods are available to maintain a fleet of batteries. A simple, self-governing system is illustrated in Figure 11-4 to Figure 11-6. Only 30 minutes per day should be required for a technician to maintain the system. One or several battery analyzers are needed that are capable of producing battery labels. Figure 11-4: Sorting batteries for servicing. Each time a battery is taken from the charger, the user checks the service date on the label attached to the battery. If the date has expired, the battery is placed in a box marked ‘To be serviced’. Figure 11-5: Servicing expired batteries. Batteries with expired dates are exercised; those that do not recover to the preset target capacity are reconditioned. Batteries that pass are re-certified by attaching a new label with dates and capacity reading. Figure 11-6: Returning batteries to circulation. After servicing, the restored batteries are returned to the charger; those that failed are replaced with new ones. Battery maintenance assures that all packs perform at the expected capacity level. When taking a battery from the charger, the user checks the service date on the battery label. If expired, the battery is placed into the box marked: ‘To be serviced’. Periodically, the box is removed and the batteries are serviced and re-certified with a battery analyzer. After service, the batteries are re-labeled and returned to the charger. Those batteries that fail to meet the target capacity are replaced with new packs. All batteries in the charger are now certified to meet a required performance standard. Battery maintenance has been simplified with the introduction of battery analyzers that offer a target capacity selection. 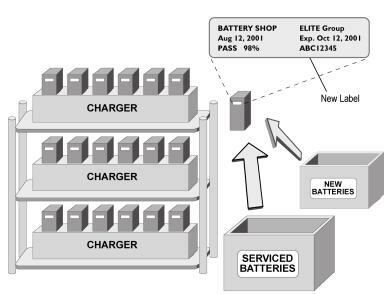 All batteries must meet a user-defined performance test or target capacity to pass. Nickel-based batteries that fall short of the required capacity are automatically restored with the analyzer’s recondition cycle. Those packs that fail to recover are subsequently replaced with new packs. Recondition is only effective for nickel-based batteries. It is worth noting that batteries with high self-discharge and/or shorted cells cannot be corrected with recondition; neither can a battery be restored that is worn out or has been damaged through abuse. Another group of batteries that cannot be deep discharged by recondition are ‘smart’ batteries. This includes any pack that contains a microchip that must be maintained by a continuous voltage supply. Discharging these batteries below a certain voltage point will put the battery to sleep. A recharge often fails to wake up these batteries. Some entrepreneurs have come up with the novel idea of providing a service to test and restore rechargeable batteries. They operate in convenient locations such as downtown cores, shopping malls and transportation hubs. Customers bring in their batteries to have them serviced. The packs are tested and reconditioned with automated battery analyzers. A full performance report is issued with each battery serviced, showing service date, performance status and the date for the next service. The suggested fee per battery is $10.00US. Higher prices can be requested on specialty batteries which are expensive to replace. For organizations using a large number of batteries, a special pick-up and delivery service can be organized to provide scheduled maintenance. 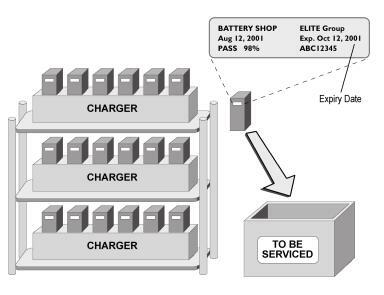 This ensures that fleet batteries used by organizations are regularly maintained. Such a service would benefit firms that do not want to bother with battery maintenance or do not have the expertise or resources to perform the task in-house. Increasingly, dealers who sell mobile phones, laptops and camcorders also provide battery service. This activity increases traffic and helps foster good customer relations. A new battery is sold if the old one does not recover when serviced. By knowing that a battery can be checked and possibly restored, customers may try to salvage their weak batteries before investing in new ones. Some dealers may be reluctant to restore used batteries for fear of reduced battery sales.